Collect casino rewards and play with casino bonuses on the move using BETAT Mobile Casino. It’s a dedicated mobile casino that gives you quick and convenient access to video slots and casino games. Open an account today and you can claim up to £500 in free casino money, plus also get 50 free spins. It doesn’t matter whether you use a mobile or desktop device to register. Simply follow the link above to sign up. Upon making your first deposit of £20 or more, you’ll receive a 100% casino bonus, up to £500. You’ll also get 50 free spins to play on either Starburst or the current Game of the Week at BETAT Casino. This casino is licensed and regulated by the Gambling Commission of the United Kingdom . 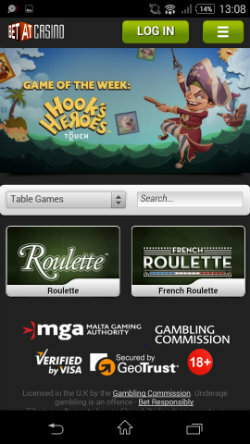 This allows you to access the casino and play games from anywhere within the UK. Over a reliable 3G/4G data or wi-fi connection, you’ll be able to to play slots online. There is no need to download any software, as the instant-play games run directly from your mobile browser. You can see straight away that BETAT Mobile Casino is aesthetically pleasing. The dark background allows game icons and images to really stand out. It is nicely styled and not too cluttered, which makes for a more pleasant browsing experience. The games lobby is topped by a fairly large advertising space. This is a rolling slideshow of images to showcase new and popular games as well as any exciting casino bonuses. Underneath this is a drop-down menu with options to filter games by; All Games, Recommended, Video Slots or Table Games. Alternatively, if you know the name of the game you’re after, simply type it into the text search box. At the very top of the page is a navigation bar but sadly this does not remain fixed to the top of the screen as you scroll. This is a shame as the BETAT Casino logo acts as a home button and there is also a menu on the right. This menu gives you access to your account area, bonuses and promotions, customer contact, information on responsible gambling and an option to view the desktop version. 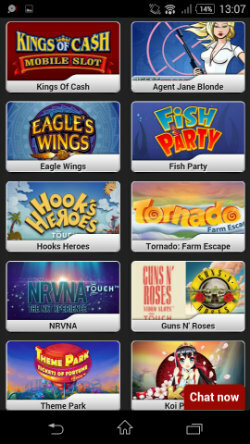 There are over 90 games to choose from at this mobile casino which is not the biggest selection but is more than adequate when compared to some alternative operators. 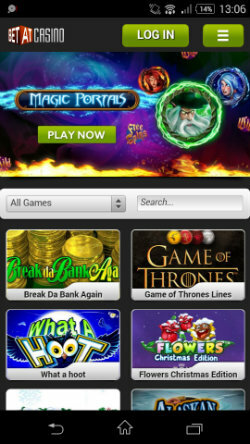 The majority of these games are mobile slots with some of the most popular titles available. You can play Agent Jane Blonde, Hook’s Heroes, Blood Suckers, Game of Thrones, Starburst, Thunderstruck, Dead or Alive and many more. The casino games section is limited to Roulette and French Roulette, so online Blackjack players will be disappointed. Playing the games is simple. Just scroll to your selected game and tap on the image. You’ll have a choice of playing for fun in demo mode or playing for real with a chance of winning cash prizes. We sampled a good selection of the games and can report that they all loaded reasonably quickly and we had no problems in terms of glitches or game flow. So really this is a good mobile casino for slots players with a bit of Roulette thrown in. Navigation is not perfect but we certainly didn’t find it fiddly to get around and you’ll have a handle on it right away. The lack of Blackjack or any supplementary table games mean that it does not have the variety of other mobile casinos. However, it’s perfect for playing slots on the go and comes highly recommended if you’re someone who likes to to spin the reels.